Yesterday’s blog post asked “Are University Web Sites In Decline?“. Although some anecdotal evidence suggests that in a number of cases this may not be the case, it is also true that there is increasing competition for ‘eyeballs’, with many organisations being prepared to invest resources for search engine optimisation and related techniques in order to maximise traffic to Web sites. The JISC is looking to enhance the visibility of Web sites within the .ac.uk domain. JISC inviting those working in the provision of institutional Web sites to consider bidding for participation in a community of projects that will enhance your .ac.uk web site to make Web site resources more easily found. These projects will innovate around the “JISCLINKU” Toolkit product which is currently under development which will help to exploit the benefits provided by a variety of linking and related strategies. Funded projects will beta test and advance the JISCLINKU Toolkit and help make it ready for use across the wider sector for the start of the next academic year (2012-13). A key institutional driver for this work will be raising the visibility of institutional Web sites to attract the intake of new fee-paying students. Bids are due by noon on the 21st November 2011. The successful projects would be expected to start in as part of the community work in February 2012. Are University Web Sites in Decline? Are Web Sites In Decline? Are organisational Web sites in decline? Earlier this year an article suggested that this was the case for an number of well-known companies, such as Coca Cola (“Coca Cola’s website traffic is down more than 40% in just 12 months“). The article cited a study by Webtrends published in March 2011 which revealed that static or declining website traffic is affecting the majority of Fortune 100 web sites, with 68% experiencing negative growth over the past 12 months with a 24% average decrease in unique visitors. Are we seeing similar trends across University Web sites? A recent tweet from Martin Hawskey suggested that Google’s Double Click Ad Planner service could be useful in providing usage statistics for University Web sites. This tool has been used to provide a graph of estimated usage of the twenty Russell Group Universities for a period of slightly over a year, from March 2010 to August 2011. The findings are displayed in the following table. It should be noted that, as described on an Ad Planner help page “information from a variety of sources including anonymized, aggregated Google Toolbar data from users who have opted in to enhanced features, publisher opt-in anonymous Google Analytics data, opt-in external consumer panel data, and other third-party market research“. In order to see if the findings were reproducible using other tools the Google Trends service was also used. The findings are depicted below, with trends since late 2008 being shown in groups of five institutions. It can be seen from these comparisons that similar trends are taking place across all twenty Russell Group Universities, with the possible exception of Warwick University, which did not see a drop in usage in 2009, although after this its usage patterns followed that of the other institutions. It should be noted that the Google Trends site does give the warning that “several approximations are used when computing these results” and gives the warning that “All traffic statistics are estimates“. The site goes on to add that “The data Trends produces may contain inaccuracies for a number of reasons, including data-sampling issues and a variety of approximations that are used to compute results” and gives the warning that “you probably wouldn’t want to write your Ph.D. dissertation based on the information provided by Trends“! So perhaps it would be inappropriate to make policy decisions based on this data. But if no addition data is available, how else can be make evidence-based policy decisions? And as described in a post on “University Web Sites Cost Money!” we know that the Daily Telegraph has a record of publishing an article entitled “Universities spending millions on websites which students rate as inadequate“ based on flawed interpretation of statistics gathered using Freedom of Information requests. Unless and until universities are willing to openly publish Web site usage statistics we need to be prepared to accept that alternative metrics may well be used. Whilst the evidence is suggesting that we are seeing a slight decrease in the amount of traffic to institutional Web sites for Russell Group Universities, there is additional evidence which suggests that the same group of twenty UK Universities are seeing increased activity across the institutions’ Facebook sites. As summarised in a recent post entitled Is It Time To Ditch Facebook, When There’s Half a Million Fans Across Russell Group Universities? “in a period of nine months we have seen an increase in the number of ‘likes’ for the twenty UK Russell Group Universities of over 274,000 users or almost 100% with the largest increase, of over 155,000 occurring at the University of Oxford“. The post goes on to describe how are “seeing a huge increase in the number of Facebook ‘likes’ with all of the institutions seeing a growth of between 33% and 345%“. The findings from the declining usage of institutional Web sites could be used to question the importance of those working in institutional Web teams. However the evidence from Facebook suggests that certain services initially provided on institutional Web sites seem to have migrated to popular social web services – and clearly there will be a need to manage the content and interactions with potential students wherever such interactions take place. For example a couple of day ago a post on Mashable described 7 Ways Universities Are Using Facebook as a Marketing Tool which included providing virtual tours; demonstrating pride in the institution; marketing ‘shwag‘; supporting alumni activities; sharing departmental; content; reaching out to potential students and exploiting geo-location services – all activities which will require institutional support. The importance of social web across higher education has also been identified in an infograph which was launched in August 2011 in a post entitled “How colleges and universities have embraced social media” on the US-based Schools.com service (and embedded in this post). For universities, deciding to use social media is a no-brainer. The 18- to 24-year-old college student demographic is all over the social web, and its younger counterpart (the high school crowd) is equally immersed. Already, many schools have leveraged social media in a big way. In fact, a recent study showed that an astounding 100% of universities have a social media presence. From luring in potential new students with admissions blogs and creative use of location-based services like SCVNGR, to keeping alumni engaged via dynamic, content-rich Facebook and Ning communities, to informing students about campus offerings through Twitter feeds and YouTube videos, it’s clear that universities recognize the importance of social media. But in addition to the popularity of Social Web sites, another possible reason for the lack of growth in usage of institutional Web site may be a consequence of the difficulties in navigating such sites on mobile devices. In the US a Read/Write Web article informs use that “7% of U.S. [is] Web Traffic From Handheld Devices“. How many institutional Web sites provide easy-to-use interfaces on mobile devices, I wonder? There is a danger that the evidence of decline in traffic to institutional Web sites could be used to justify cuts in levels of funding for institutional Web teams. However additional evidence suggests that users may be simply making use of alternative sources of information and interactions or may be using mobile devices which may provide cumbersome experiences when accessing sites which have not been configured to provide optimal interfaces when using small screens, no mouse interface and other characteristics of mobile devices. I think it would therefore be a mistake to argue that there is a decrease in interest in or relevance of online services which may initially have been provided on institutional Web sites. Rather I feel we are seeing a move towards a variety of cloud-based services. The high-profile services may include Facebook together with social media sharing services such as YouTube and iTunes (for which usage across Russell Group universities has been documented in posts on How is the UK HE Sector Using YouTube? and What are UK Universities doing with iTunes U?). But in addition we are also seeing policy and funding decisions being made by funding bodies such as HEFCE which will see a move towards cloud-based services which will be more closely-aligned with the requirements of the UK’s higher education sector, with the migration of the Jorum service from a project to a service role providing a good example of how key online services traditional hosted within the institutional may be more cost-effective if hosted externally but developed with the needs on institutions in mind. How should the evidence, such as the examples I’ve listed in this post, be used to inform institutional policies, I wonder? And might there be a need to make changes to existing Web team structures, if responsibilities for managing institutional Web sites are separate from managing content and interactions hosted outside the institution? Guest Post: Lend Me Your Ears Dear University Web Managers! This is a guest blog post by David F. Flanders (JISC Programme Manager responsible for persistent identifiers) and Joss Winn (Project Manager of the ‘Linking You Toolkit’). They ask for your opinions on some potential future work that JISC would like to take forward on behalf of the sector. JISC is considering future opportunities for innovation funding in collaboration with University Web Service departments who have responsibility for managing the .ac.uk pages of their institutional website. We’d like to make sure that what we are proposing would be of value to the sector and is interesting enough for several of you to consider bidding. Please make your opinion known using the #lncneu hashtag on Twitter or by adding a comment to this post. In short, you’re just mapping what we hope will become a common URI structure to your current link architecture, which means you can continue to change and add more links to your architecture (as the organisation changes) and you would just continue to redirect the ‘common’ link as recommend by ‘linking you’ to the underlying link. This process need not affect the design or apparent structure of your website. Management of robot.txt files: If a group of Universities started adopting these URL syntaxes, we could save time and money by generating a common robot.txt for all of us so to use so we don’t have to each write a robot.tx file, this would also make doing analytics across the sector enhanced as we could understand patters of clicking across all .ac.uk websites. A simple mapping tool: An apache mod_rewrite (or IIS, nginx, etc. equivalent) tool that will do most of this work for you that could be written once and support many! Improve discovery: Clear human-readable URLs are now integral to browser search and lookup technology and becoming essential if you want to enable ease by a student experiencing your website. Provision of a course catalogue: As many of you know JISC is actively encouraging universities to create XCRI feeds for their courses. If everyone producing an XCRI feed put it at the following URL http://www.foo.ac.uk/courses/xcri/ we’d lay the groundwork for persistent, structured course data that developers (many of them students) could use to build new and engaging apps and websites that we could all benefit from. Provision of news feed aggregators: If we all knew where all the corporate news feeds were e.g. http://foo.ac.uk/news/rss we could create a UK University News Aggregation Service where the sector could have their news published on demand, let alone text mining goodness and other filters for highlight key news developments across all higher and further education institutions. A sector wide directory: Common information such as institutional policies, contact information, news, about, events, etc. could be aggregated into a searchable directory; useful to both the public and HEI data geeks. Managing your assets: Your .ac.uk addresses can be understood as your ‘virtual real estate’. Adopting a well-formed, widely understood and persistent ‘portfolio’ of core web addresses will help University Web Managers manage these increasingly valuable assets. Use ‘Cool URLs’: Simple, stable, manageable URLs make sense. They are recommended by the WC3, to make Web Managers’ lives easier and keep users happy, too. Those are some of the reasons we can think of and we think there are many more if even a little imagination is implied. We’re convinced that if we all worked together as University Web Managers across the UK sector we could achieve more than the sum of our parts by producing this URL structure for each institution. What kind of idea do you think you could achieve by adopting the ‘Linking You’ toolkit? We’re thinking of funding several short projects to review and standardise the toolkit, put it into practice and then write up the case studies for the sector on how it worked for you and what value you see in doing this work. Are you interested? What are your thoughts on all of this? The IWMW 2011 event, the fifteenth in this annual series of event aimed at members of institutional Web teams, took place at the University of Reading on Tuesday and Wednesday, 26-27 July. At the IWMW 2010 event the theme was “The Web in Turbulent Times” and we addressed the implications of the financial crisis and the expected changes in funding for higher education for those working in the sector and in institutional Web teams in particular. This year’s theme was “Responding to Change“: we acknowledged that we were living in radically changed environment and needed to be able to respond to such changes rather than wishing for a return to the past. One aspect of how the sector could respond to changes which was addressed at the event was to help gain a better shared understanding of the institutional Web management Community of Practice, which I described in a recent post. Is there still a need for a institutional Web management CoP – after all there isn’t (although I could be proven wrong!) a whiteboard CoP? This question was touched on at last year’s event when Susan Farrell asked “Are web managers still needed when everyone is a web ‘expert’?“. How will political and funding changes to the sector affect the institutional Web management CoP? Might we find that a more competitive environment and the moves towards the provision of privatised higher education providers result in a community which is much less willing to share, help, advise and support one’s peers? Is there a need to revisit the online tools which can help to support the community, especially in light of the significant decline in use of the JISCMail lists within the sector? In her plenary talk in the opening session at IWMW 2011 Amber Thomas of the JISC spoke about Marketing and Other Dirty Words. Amber suggest that there is now a need for those involved in the development and support of online services to go beyond their comfort zone (which revolves around concepts such as “open access“, “academic autonomy“, “public good” and “language of values“) and engage with the dirty words of “impact“, “brand“, “metrics“, “marketing” and “language of the market“. Amber argued that the need to move beyond one’s comfort zone would also be the case for other grouping within institutions, including researchers, teaching and and learning staff, marketing people, community outreach and engagement people, etc. Many people within the institution will be looking to those with IT and online skills (including expertise beyond use of services hosted in the institution) for advice and support. There should also be opportunities for those working in institutional Web management teams to demonstrate their value to core institutional services. After the doom and gloom which we saw in the opening session of last year’s event it was good to see that this year’s event began with such optimism. But how might institutional Web teams engage with this new environment, especially when there are existing services will still need to be provided with, in some cases, downsizing of Web teams having already taken place or restructuring process being in place? These issues were addressed in a session I facilitated entitled The Web Management Community: Beyond IWMW and JISCMail Lists. It seems there was a strong feeling that the benefits of being a member of a community which existed in the early days of the Web (getting help and advice; sharing concerns; learning from others; etc.) were still feel to be beneficial – there clearly isn’t a feeling that the provision of institutional Web services is now a mature technology with little to be learnt from others. There was a minority view that the greater competition across the sector would result in a reluctance to share success stories – however others felt that the competition would take places in other areas, with a feeling that we would continue to see sharing of best practices for providing the online infrastructure which is now so important across the sector. Although there may have been some disagreements on the extent of collaboration and sharing there was agreement that there is a need to explore online tools which can be used to support community activities which are aligned to personal (and institutional) needs. In discussing various online tools which may have a role to play we discovered that most people in the session have a LinkedIn profile. But in addition to LinkedIn’s use for hosting CVs (and concerns over uncertainties regarding jobs seemed to be a reason for joining LinkedIn) the services also hosted many online groups which can support professional activities. I pointed out a number of existing Web-related groups such as the Web 2.0 for Higher Education group. However such existing groups will tend to have a US focus and topics of particular interest to our community (such as UK cookie legislation, Web accessibility and BS 8879 and the requirement of UK HEIs to provide KIS data) would have little or no meaning to existing US members. Should, therefore, we set up a UK-focusssed LinkedIn group? That question was answered not by making a recommendation that we set up a working group to evaluate the potential of LinkedIn to the sector. Instead Stephen Ashurst, Senior Multimedia Designer at Loughborough University, simply created the UK HE Web Professionals group. As can be seen there are now 26 members. There are also some additional benefits which this service provides which are not available in JISCMail lists such as the improved user interface, display of connections, etc. Whether this group becomes sustainable and provides a useful service for the community remains to be seen, but I personally do appreciate this grassroots initiative from someone who is using LinkedIn groups to support activities in other areas. Following on from discussions about LinkedIn the group went on to discuss the role of Twitter. Some people in the session regard Twitter as part of the portfolio of tools they use to support their community engagement whilst others admitted (in response to my leading question) to not ‘getting’ Twitter. There is an action on people to write a post on the relevance of Twitter to the sceptic which I will publish shortly. In the meantime I have created a Twitter list for the institutional Web management community called iwmc. 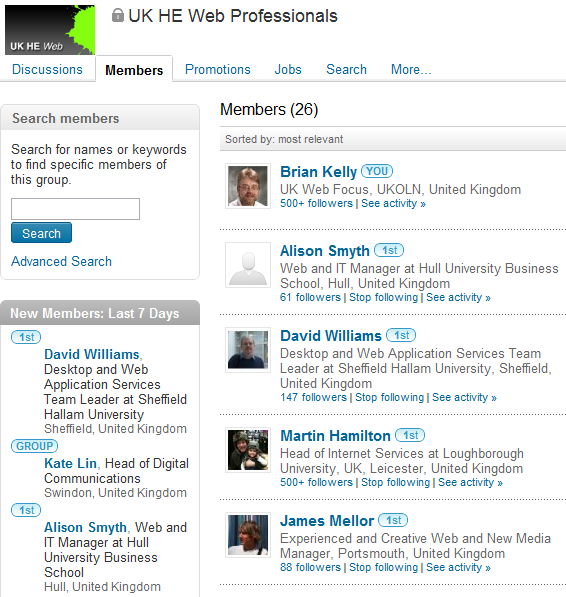 I will be happy to add anyone who regards themselves as part of the institutional Web management community (which will include those who have attended IWMW events, are members of relevant JISCMai lists or have general involvement in managing institutional Web services in a UK University or related service) to this list. The simplest way to be added will be to publish a tweet with the hashtag #iwmc. I’ll search for such tweets and add people to this list – and will include in my blog post details of the potential benefits of such Twitter lists. 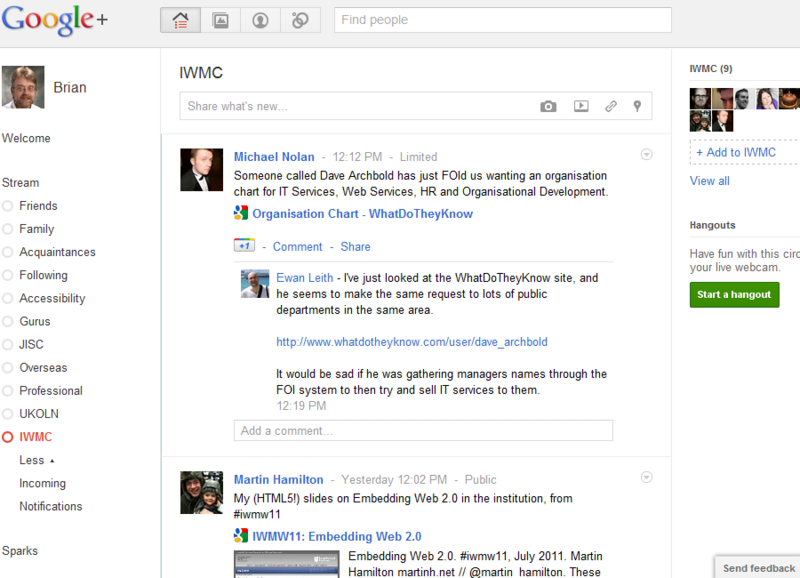 Inevitably there was also interest in the potential of Google+ to support the Web management community of practice. It seems that I am not alone in being both very interested in the potential of Google’s latest development in the social Web sphere whilst also being uncertain as to whether it will be a success (unlike Google Wave and Google Buzz) and, if so, how it can be used. There was a feeling that Web managers could regard the release of Google+ and the undoubted interest it has generated as an opportunity for hands-on evaluation in order to be able to be seen as an authoritative source within the local institution for the various grouping who are likely to be interested in making use of Google+. It seems many of us are grouping our Google+ contacts into friends/family and professional. I, too, have Friends and Families Circles and have also created Circles for JISC and UKOLN contacts, Gurus (typically US experts who will have large numbers of followers), Overseas contacts (will this morph into a non-English language Circle, I wonder) and an initial subject-based circle for those who have a strong interest in accessibility interests. I have also created a Circle for those who I regard as part of an institutional Web management community. Currently there are only non people in this Circle, but I will be looking to include more in order to see if it can provide ways of both managing this network in ways which can’t be done easily using Twitter as well as providing richer functionality. This morning I came across a link to a post on Google+ Implications for University Recruitment which described how organisational profile in Google+ “should be back in the next few months (with analytics), and universities need to be ready this time (compared to most campus’ delayed foray into other popular social media)“. Let’s use this opportunity to gain expertise in Google+ so that we are prepared to advertise not only those involved in student recruitment but also in research and development activities, for example. We have an opportunity demonstrate that the advantages of centralisation which the government are proposing can be achieved by collaborative working across the sector. The concluding session at IWMW 2011 provided an opportunity to highlight some of UKOLN’s activities for the sector and also to hear examples of how the sector has been working collaboratively and plans for renewed areas of work. UKOLN’s Institutional Web Team Blog Aggregator was formally launched in this session. This Drupal-based service harvests blogs provided by institutional Web teams (or by individuals who working institutional Web teams) based on a list of such blogs originally gathered by Mike Nolan of Edge Hill University (unfortunately when we used this list we failed to include the Edge Hill Web Service blog itself, so apologies to Mike and his team for having failed to harvest his team’s posts). We have now added the Edge Hill Web Services blog to our list. We will shortly be looking to set up a small group which can advise on future developments to this service (policies on blogs to be harvested; categories to be auto-classified; developments to the UI: etc.). If you wish to submit your blog for inclusion in the blog aggregator, a submission form is available from the blog’s home page, as illustrated. Incidentally Chris mentioned that he had been inspired to set up a Web team blog after attending an IWMW event a few years ago and hearing, from Mike Nolan, I think, of the benefits to be gained from blogging. 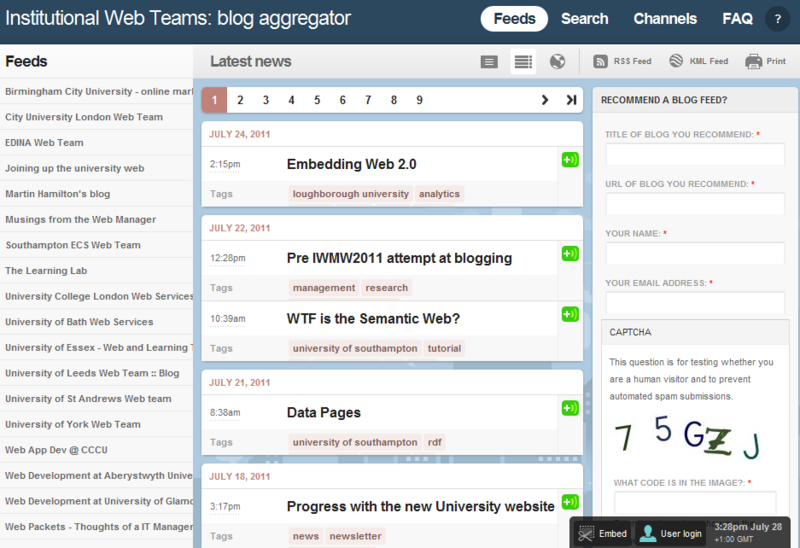 The University of Southampton ECS Web Team blog is currently the main provider of posts related to Semantic Web and Linked Data developments. I’m really pleased that the ECS Web team is willing to share its expertise in this areas. I suspect that Chris and his colleagues will be looking forward to reading posts form other institutions who may be deployed Linked Data services – and with the blog aggegrator’s auto-categorisation feature and RSS export capability people with a n interest in this area will be able to subscribe to the Linked Data and Semantic Web channel. Just before the IWMW 2011 took place Claire Gibbons, manager of the Web Team and Marketing Team published her first blog post of the year. As she described in the post she left IWMW 2010 “all refreshed and guns ablazing for blogging“. However she shortly afterwards acquired responsibility for managing the Marketing Team in addition to the Web Team and pressure of work meant she was unable to find the time to blog. And yet in her post Claire managed to summarise recent activities of the Web team and outline new areas of work her teams will be addressing in the near future. This is valuable content – and if all 168 participants at IWMW 2011 had written a page each since last year we would have a valuable community resource which services such as the blog aggegrator could provide access to. A page a year is clearly achievable. Might it be possible for all attendees to write a page a month, I wonder? That would provide over 2,000 items which could cover what Web teams have achieved and developments which are being planned. As with many social networking services, the blog aggregator will improve as the numbers of contributor grow. Let’s hope Claire’s post inspires others to blog, even if infrequently. There must be many activities that we are all doing, usually the boring stuff, whereby sharing ideas and resources would benefit us all. Two things spring to mind – the social media policy and the recent review to Privacy Policies that the cookies law brought about. Claire repeated this in the closing session and invited others who have interests in these two areas to get in touch with her. I’m looking forward to seeing how such grass-roots plans for collaboration develop. Duncan Ireland, University of Strathclyde, described how he, too, had been inspired to do something differently after attending his first IWMW event. In his case there was a realisation that there need to be more than an annual event which led to the establishment of the Scottish Web Folk Group, which has a JISCMail list and a regular meeting. This could provide a framework for use by other regional activities – and Duncan argued that distance shouldn’t be a barrier since Web team members from the University of Aberdeen, for example, are will to spend four hours travelling since they feel there are tangible benefits to be gained from meeting with one’s peers. The IWMW concluded by discussing next year’s event. We can no longer automatically assume that activities which are highly regarded will necessarily continue. However we were able to report that an IWMW 2012 event has been included in our work proposals for next year and we feel that we have gathered evidence of the value and impact of the event and its importance in supporting JISC’s activities and interests. We will shortly be starting discussions for a venue for next year’s event. In addition we are aware that many people felt that two days were too short to ensure effective networking takes place. A show of hands in the final session made it clear that a majority would prefer a return to the three day format we have used for every year apart from the first event. We will shortly be analysing the evaluation forms in order to gather a more complete picture which will help us to inform our planning for next year. My colleague Marieke Guy has announced the call for proposals for talks, workshop sessions and other suggestions for this year’s Institutional Web Management Workshop (IWMW 2007) which will be held at the University of York on 16-18th July. I established the IWMW series of workshops back in 1997 and last year, when Marieke took over responsibility as the workshop chair, it celebrated its 10th anniversary. Last year workshop was successful in attracting the largest ever audience (with almost 200 participants) and, judging by the workshop evaluation, probably the most successful event. The theme for this year’s event is “Next steps for the Web management community”. The event will explore how we can build on the successes of the first ten years of the institutional Web management community. 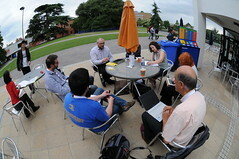 An innovation that has been introduced this year is the call for proposals for working group session based on collaborative working in areas of interest to the Web management community which may have started prior to the workshop or for which the event aims to provide a starting point for collaborative working which will continue afterwards. Proposals for talks, workshop and working group sessions should be sent to Marieke by 26th February. UKOLN has hosted the Institutional Web Management Workshop every year since 1997, with this year’s event being the tenth in the series. At the workshop a number of participants commented that they felt themselves to be a member of the Institutional Web management community, with the event providing the main focal point for the community, with the web-support and website-info-mgt JISCMail lists providing additional mechanisms for community sharing and collaboration. The IWMW 2006 event highlighted the importance of Web 2.0 to the community. Since the workshop a range of presentations and events have been held throughout the country. And on 1 November 29006 2006 (my tenth anniversary at UKOLN) this Blog was set up. The Blog has not been announced on mailing list in order to gain experience in Blogging and the time and effort needed to Blog in a sustainable fashion. However it is now timely for an official launch of the Blog, which has been announced on the web-support JISCMail list. The Blog will cover areas related to the Web, especially areas of interest to our key communities (the higher and further education and cultural heritage sectors, the digital library development and research communities and the institutional Web management community). In order to support the institutional Web management community, a well-established and thriving community of practice, posts on this Blog which are likely to be of interest to the community will be tagged with the ‘IWMC’ tag. I would encourage members of the community who are setting up Blogs with similar roles to use the same tag, to help in finding and sharing posts. I would also invite Bloggers from the IWMC community to contact me (using email or by commenting on this posting) with details of their Blog. As a follow-up, give reasons why the opposite of what you said may be true. Please use the comments box for your thoughts. Terry’s right – these are my favourite FireFox extensions. They are illustrated below. The RSS Panel Greasemonkey script (on the left) appears if a Web page contains an (autodiscovery) link to an RSS page. Initially it appears as a floating window simply containing the title of the RSS feed. On opening the window access to all of the RSS links is available, as illustrated. The Google Web Comments extension provides an interface to Google’s Blog Search service. If a blog entry has links to a page you are viewing (or pages below it) an indication of this is displayed in the bottom right hand corner of the browser status bar. Clicking on the icon results in the title of the posting appearing, as illustrated. It was using the tools that I came across David Rothman’s comments about a recent talk of mine. Colorful Tabs – which I must get round to installing. You’ve now heard about our cool FireFox extensions – what are yours? How should an institution seek to address deployment strategies for Web 2.0? One approach would be to hold a high-profile event, with talks from some of the early adopters of Web 2.0 technologies and senior managers in the institution, external speakers to provide insights from outsiders (who will have a disinterested view of local power struggles and political intrigue!) and, if you are feeling brave, perhaps including views from the student contingent. And as well as talking about Web 2.0 technologies, you might even seek to embed the technologies in the event, with remote participants, chat facilities and perhaps even a Podcast. Over the past two years at venues with WiFi networks I’ve tried to make use of Wikis to support note-taking in discussion groups. This means that the discussions and recommendations can be disseminated across all participants and with the wider community – no need for the participants to frantically scribble down notes, or for my to take home flip charts, knowing that I’ll never get around to freeing the notes from the non-interoperable real world and transferring them to a digital environment. However the feedback from several events shows that the final report back session seldom seems to work. The criticism seems to have been applied to last year’s CETIS conference, as this year the required the workshop session facilitators to sum up the discussion groups deliberations in one sentence or a single image, cartoon or equivalent. This seemed to work well – and the notes are always available for browsing on the conference Wiki. I’ve suggested to my colleague Marieke Guy that we take a similar approach at IWMW 2007. Anyone reading this posting who plans on attending next year’s institutional Web management might like to give some thoughts on ways of summarising discussions in an informative, amusing or innovative way (a poem, a lyric, a movie tie-in, a mash-up, a video clip, …). Who knows, we may even provide a prize. This posting contains the content of the “Risk Assessment For Use Of Third Party Web 2.0 Services” QA Focus briefing document. It has been posted here in order to explore the use of a Blog to receive feedback on a document, as described in my previous posting on “Blogs – Suitable For Reports“. I’ve recently been evaluating the Slideshare service. Andy Powell has recently commented on Slideshare, pointing out its ease-of-use, community-based approach and trusting the users (in contrast with digital repository services developed in the UK). Andy’s comments have been picked up by Stephen Downes, who has added some of his slides to Slideshare. I’ve also been uploading a number of my slides. I’ve also embedded some of the slides into pages on my Web site (as has Lorcan Dempsey, another of my former colleagues). So what are the benefits of this? Is it just the latest Web 2.0 fad, or does it have the provide to provide real benefits? It’s good for finding slides on the same topic as yours. It can help my find new & interesting stuff – but I can also find myself sometimes surprised by the simple approach by companies from whom I’d expect a more sophisticated understanding (NOTE after pointing out the flaws in this presentation, I subsequently discovered that the presentation had been removed – BK, 28022007). To be fair, though, in this case I don’t have the context of how this slide was used or the target audience. The comments feature seems to have real potential. I’ve already started to receive a few comments, and I’ve notice how this feature can also be used as a teaching aid. It’s good to get greater exposure to my slides. As Paul Miller has said, get the data out to where the users are; don’t wait for the users to come to you. The statistics feature is also useful. As I described recently Slideshare can be used to quickly upload slides for use on-the-fly at events (in my case, when chairing a session at a Wiki workshop I had 2 minutes before the start of a talk to upload the speaker’s slides, to enable a remote user to view the slides while listening to the speaker over Skype. No time for FTPing and VPNing – but no problem in clicking the upload button and stating the URL when my introduction to the speaker was over). As mentioned, I have also embedded the slides on pages on my Web site. I’m not convinced that I’ll want to do this on a regular basis, but it does demonstrate the potential – and perhaps those who may have reservations about being seen to make use of a third party service might appreciate this feature. Perhaps the most important benefit of services such as Slideshare for those involved in Web development work is to gain a better understanding of the positive (and negative) aspects of such services, and to feed this into local development work. So I’d recommend use of Slideshare by anyone involved in developing institutional repositories – if you are going to develop similar services in-house, you’ll need to be able to compete with such services, otherwise you may find your users have no interest i using your service. Anyone else using Slideshare – or have any thoughts on its strengths and weaknesses?